Stem rack holder is made of polished chrome this stemware rack adds a touch of elegance to your kitchen or bar's décor. The rack comes fully assembled but requires installation. Hardware included for easy mounting. Installation is a breeze with the included screws and anchors. Fits under most cabinets. 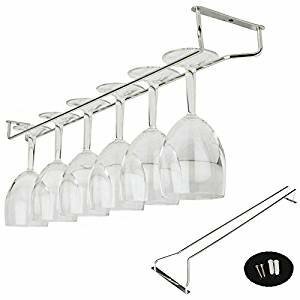 Wine Rack easily mounts under shelves or in/under cabinets to keep stemware tidy and convenient. If you have any questions about this product by gloednApple, contact us by completing and submitting the form below. If you are looking for a specif part number, please include it with your message.